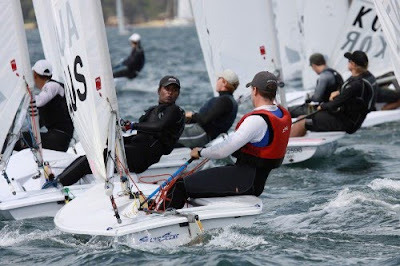 “You had to really concentrate,” said Beijing gold medallist Malcolm Page of the conditions on Sydney Harbour when he came ashore on Day 1 of Yachting NSW’s Olympic and Youth classes Sail Sydney regatta this afternoon. 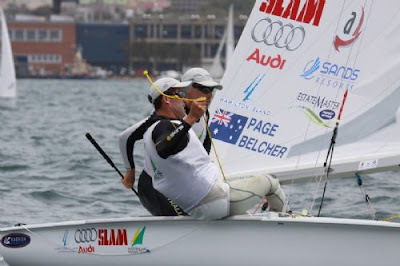 The Australian Sailing Team pair finished the day with second place and a win. “The Kiwi girls beat us in the first race,” Belcher said. “Yeah, but it’s only our first race of summer,” Page laughed. Everyone had similar weather stories, the difference being it suited some, but not others. Olympian Mike Leigh (CAN) was one of those who was not too fazed by the patchy shifty winds that existed on the Harbour all day – nor did he let the traffic upset him. “It was pretty all over the place with the shifts - typical Sydney Harbour really – you look glamorous one minute and you’re ducking ferries the next, but I had a great day,” surmised the Canadian Laser sailor who leads a strong fleet after scoring 2-3-1 results. Two other Beijing Olympians did not come off the water happy. Two-time world champion Tom Slingsby from Australia: “I sailed really badly,” he said, even though he is fourth overall following three races, his second overall in Race 3 helping him on the ladder. Matias Del Solar agreed with Slingsby. 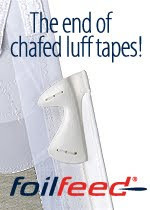 “No good – very bad – hard day,” said the Chilean sailor, whose best result was a ninth. Nathan Outteridge and Iain Jensen (AUS) the current 49er world champions also had their frustrations. “It was pretty frustrating. It was very shifty and we did a lot of things wrong,” Jensen commented. The pair is third placed after scoring 3-3-4 results. Euan McNicol (AUS), noted for his 18ft skiff sailing, said: It was really tricky, but these are my home waters, so I have no excuse. We won the first race, so that was pretty good.” He and Tim Austin are currently second placed following three races. The New Zealand pair of Peter Burling and Blair Tuke currently lead the series scoring solid 2-1-2 places. The Finn class sailors enjoyed some of the best competition they’ve seen in Australian waters since the Sydney 2000 Games with 15 entrants from around the world.